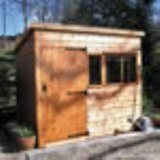 This log cabin is manufactured in 40mm interlocking wall logs in untreated white pine without a floor as standard although a floor can be purchased as an option. The Chamonix I log cabin comes with red beaver-tail roof shingles, a single part glazed (Perspex) door and a single window in the front elevation and a single window on the side. Window shutters and flower boxes are also included. Please Note: If a floor is ordered as an accessory to this log cabin, it will be need to be cut to the correct dimensions. 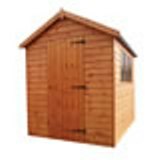 Please Note: The Solid cabins are supplied untreated and are supplied with Perspex glazing for safety. Should glass be required this is very easy to retrofit due to the glazing bar system. Delivery: There are additional delivery charges to Wales, Cornwall & delivery addresses between Leeds and Scotland - Please contact us for further details on 01604 780 350. Scotland, Remote parts of England and Wales, Off Shore Islands, Ireland and the Scottish Isles incur an additional delivery charge, please contact us on 01604 780 350 prior to ordering, or your order may be delayed. 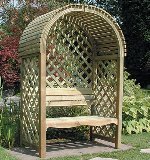 A pressure treated Victoria Seated Arbour from Rowlinson Garden Products. This is a full size Italian FAS table designed for adult use. Available in blue or red finishes. Ideal for use in a log cabin. Original Tuffbox lockable toolbox, a secure solution for the storage of tools within your work van or truck.